With relation to stones, we observe two kinds of people: those who cast them and those who collect them. Of those who cast stones, some do so from fear, while others do so strategically. The fearful cast their stones either from glass houses or at glass houses. The former are the hypocrites, while the latter are self-righteous, and both are equally insufferable. The fearful cast their stones in reaction to something and not because of a belief in something, less from the solidity of their own convictions than from a nagging sense of their fragility. The fear that causes these stones to be cast comes from inside the throwers and, like the stones they throw, is projected outward into a hostile and alien world. The strategically inclined cast their stones either from a position of strength or at a position of strength. Both tend to claim truth as their ally, and the truth tends to flee equally from either, for the truth is seldom on the side of casting stones. Truth, being what truth is, can win its battles without stones, or in spite of them, because all positions of strength are time-bound and predicated on illusion. The emperors will never wear clothes. Their castles will all be made of sand—and glass, as we know, is nothing but sand. The collectors of stones are mainly of two kinds. They are either martyrs or future throwers of stones. Of martyrs, there are two types, the situational and the pure. The former are those who, upon being showered with stones, simply die because they are overcome. They die because nothing else is possible, regardless of the degree or intensity or their fervor. No one can prove whether situational martyrs were committed to a cause, or if they just happened to be in the way of an angry mob. Situational martyrs die in the right time at the right place before they can get bored or do something that would cast aspersions on their martyrability. A great many narcissists have achieved sainthood this way. Pure martyrs collect stones in order to cleanse the world and remove hatred so that the rest of us can live in peace. While their service to humanity is well-recognized, in life most of them are indistinguishable from narcissists. The pure martyr is only revealed in death, for in death their purity is preserved. Die young, stay pretty. Pure or situational, martyrs are the scissors-carriers of the world. Yet as our mothers told us, running with scissors will be no escape, for those with scissors will always be crushed by those throwing stones. The future throwers of stones are the paper carriers. They cover stones and rocks to avoid martyrdom. For more than a few, not coincidentally, throwing stones is a second career taken up after re-assessing the limitations of an earlier vocation to martyrdom. They cover the stones that have been cast at them, but then they tear away their paper covers and cast those stones back again. Thus we observe the cycle of stone-throwing and fear in which victims recycle what has happened to them, joining the ranks of oppressors and casting off the stones they once hid beneath paper. Write what you know, as the saying goes. It is thus that we arrive at the central problem facing humankind: In a world of human conflict, no one will win. Neither the throwers nor collectors of stones can vanquish the other. Neither righteousness nor evil will win the day, which may be some comfort for those who wish to avoid evil but not so much for those who wish to achieve righteous glory. This is because victory by either side—stone throwers or stone collectors—would require settling differences among adversaries in ways that are not possible to achieve. The stone throwers face each other in glass houses, which before long will lay about their feet in shards and pieces. Of those who collect stones, the paper carriers who are the future throwers of stones will allow the stone throwers to crush those with scissors, who in martyrdom provide the narratives and scripts that give the rest of us hope. Yet once all the martyrs are gone the future throwers of stones will become simply the throwers of stone and new martyrs will emerge with sharper scissors to cut the old paper into bits. The fortunate thing is that we are defined not only by our relation to stones, conflicts, or disagreements. We are bigger than this. Our world is increasingly one made of glass in which the things we wear and say and claim dissipate around our bodies like lost auras or the blinding penumbrae of lives best viewed through smoke-colored glasses. Seeking truth in this haze is both a worthy and a necessary endeavor, though a thankless and quite possibly never-ending one as well, whose value lay more in the seeking than in the finding. 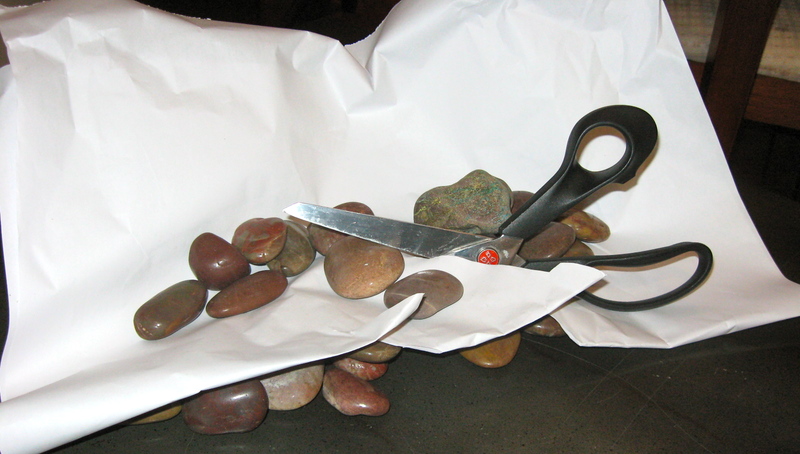 The photographs of rocks and stones and scissors were taken by the author. The photograph of Philip Johnson’s Glass House is from the Wikimedia Commons and is available for common usage. The Sandcastles are also courtesy of Wiki Commons. Rock/paper/scissors—RPL as it is commonly known —is a game of strategy, cunning, and skill. Or so the World RPS Society would have us believe. Apparently, RPS has been used to resolve disputes for hundreds of years, supplanting dueling and other more barbarian forms of conflict resolution. If only Alexander Hamilton had known. The math whizzes at PlayRPS.com have devised a simple playable RPS game that allows anyone to use the method to resolve their disputes. To the naive, this could be very useful, for example, in the current Israeli-Palestinian negotiations, greatly facilitating Hillary Clinton’s job. The only problem is that while on average RPS tends toward random distribution of the results (i.e. on average rock, paper, and scissors even out over time), in any one instance the odds are overwhelmingly that one outcome will have more wins than the others. For example, the odds that the results after 99 efforts will be 33-33-33 are slimmer than the odds that it will be unbalanced and favor someone. Level results happen only if the total number is divisible by 3, which further narrows the odds. Any odd number of games (and any idiot who agrees to play with an even number of games deserves to lose) that isn’t divisible by three guarantees that someone will have more wins than the others. RPS actually exemplifies the perfect mathematical expression of the futility of human design and intentionality: It is a conflict resolution device almost perfectly designed to engender more conflict. RPS is more elegant than “Murphy’s Law,” which operates by way of categorical affirmations and a priori givens, without any justification or proof whatsoever. While offering the masses a palliative notion of conflict resolution, RPS actually encodes the perfect mathematical explanation of why conflict resolution is almost completely impossible. It’s like politics in America rendered in a way that both children and adults can believe in. Randall Munroe demonstrates this in his XKCD comic strip, “Improvised,” in which RPS doesn’t do Han Solo much good in figuring out how to reply to Princess Leia in a famously tight moment, though in Han’s defense this is not the kind of proposition that is easy to deal with even under the most relaxed of circumstances. At least one financial analyst has chosen to analyze our current economic crisis as a relationship between currency and gold as one of rock (gold), paper (currency), and scissors (economic turmoil). And the television show Big Bang Theory just made it all seem silly, as it does with most things. The Rock-Paper-Scissors playing glove is a technological innovation that serves at least two purposes. It should help indecisive people make decisions in crucial moments. It is also something that Senatorial candidate Christine O’Donnell of Delaware might find use in helping people to avoid masturbating by giving them something useful to do with their hands. (Scissors and masturbation? Oops.) If the mathematical logical I outlined above holds, the glove will keep them playing forever, thus ensuring the inavailability of the hands for other, more profane purposes. Hmm . . . things that make you go hmm. . . Literally, I collect stones, interesting-looking rocks, pebbles. I put them in bowls and around candles. Every once in a while, I may throw a pebble across a lake in a half-hearted attempt to make it skip. Figuratively, I throw many stones, mostly in the form of vitriolic tirades, tirades against perceived injustice, tirades against stupidity, tirades against other tirades. So am I a martyr or a strategist, or do I just happen to like stones?